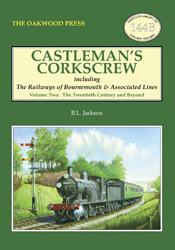 The second volume of Castleman’s Corkscrew, the sobriquet given to the Southampton & Dorchester Railway because of its circuitous route, takes the story through the 20th century in which the use of the central section of the original route declined and the new section of main line from Brockenhurst to Hamworthy Junction via Bournemouth rose to prominence on what was known as the golden years of railway. A full account of that period is followed by the difficult years of the First World War and the turbulent times through the 1920s and 1930s when many economies and changes were made including the closure of the line from Ringwood to Christchurch. A number of new works were undertaken before the onset of the Second World War put further pressure on the railway. The nationalisation of the railways in 1948, and the later Beeching report which resulted in the closure of part of the original route known as the ‘Old Road’, and the general reduction of services are all covered, as is the electrification to Bournemouth and the then unique push-all operation to extend the service to Weymouth. Individual chapters describe the architecture along the line and the signalling, followed by the extension of electrification to Weymouth and other factors that have brought the line into the 21st century. The history of the railways of this area have never been recorded in such detail before, their rise and decline together with the many social changes of the 20th century make compelling reading. A5 format, 320 pages, more than 300 illustrations.